The people at Osaka Prints give a decent summary of the background of this composition. Note that the items in bold type are our choice because of their connection to other subjects in the Lyon Collection. The main plot line (not depicted here) was based on a real-life incident from 1724 when at the Edo palace of Lord Matsudaira of Suo, the maidservant Osatsu avenged the death of her mistress, Omichi, who had been driven to suicide after being struck by a sandal — considered a terrible insult — by a woman named Sawano. In typical fashion, theatrical adaptations changed the names of the protagonists. After the lady-in-waiting Onoe uncovers a plot to seize power from the shogun by an court woman named Iwafuji, the latter insults Onoe by striking her with a sandal. Onoe commits suicide, but only after revealing the conspiracy to her maid, Ohatsu. The dutiful maid foils the intrigue and kills Iwafuji with a sword, then symbolically beats the corpse with Onoe’s blood-stained sandal. In the present play Kagamiyama sugata no utsushi-e, the Kaga clan name has been changed to Taga, hence the role Taga no Taishu. The role of Torii Matasuke originally appeared in the Kyoto-based play Kagamiyama sato no kikigaki (1780), written by Nagawa Kamesuke (died 1790). The scene shown here, once part of the original play, is no longer performed. It included an armed confrontation between Torii Matasuke and a lord named Taga. 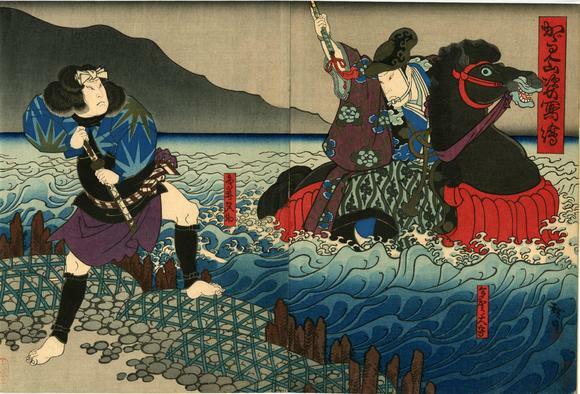 The two meet at the river's edge, Taga riding a black war horse in the fast-flowing current and Matasuke poised for action. The mie ("display" or dramatic pose: 見得) of the two actors must have thrilled kabuki audiences of the period, with Matasuke gripping his wakizashi (short sword: 脇差) and Lord Taga ready to match Matasuke's ferocity. Later in the play Matasuke sacrifices himself and then, at the climax, returns as a vengeful spirit to defeat his enemies. Chuban diptych with metallic printing and burnishing, album backed. This diptych commemorates a performance at the Naka Theater in 10/1852. Illustrated in Ikeda Bunko, Kamigata yakusha-e shūsei (Collected Kamigata Actor Prints), vol. 4, 2003, #488. Osaka Prints says that this diptych was produced by Daijin (大甚 - Marks U029).